Persistence Market Research provides the forecast and in-depth on the global commercial refrigeration equipment market for the forecast period 2017-2026. The report also analyzes the market in terms of market volume and value and offers information on the market dynamics, competitors, current market scenario, and future market growth. Year-on-year growth and important factors supporting the decision-making process is also offered in the report on the global market for commercial refrigeration equipment. In order to identify the opportunities in the market and offer a clear picture of the performance of the market in past years the report is divided into the segments including product type, application, and region. The report includes an executive summary on the global market for commercial refrigeration equipment followed by a detailed description on market drivers, challenges, and latest trends playing a crucial role in the market. The key segments and regions are further divided into sub-segments and countries. This helps to understand the global commercial refrigeration equipment market in a better way. The last section in the report is most important as it offers information on all the leading companies currently active in the global market for commercial refrigeration equipment. This section also provides a dashboard view including latest developments, product portfolio, key strategies, and financial and business overview of all the major market players in the market. The report has also been created by conducting extensive primary and secondary research on the global market for commercial refrigeration equipment. Moreover, key data points are provided in the report based on the opinion provided by the market experts. The information provided by respondents have also been cross-checked with the valid data source. The forecast offered on the market includes revenue generated and expected revenue in the market during the forecast period. The report focuses on market size in terms of volume and value for the base year i.e. 2016 that forms the basis for forecast period 2017-2026. The report also shows how the market is likely to grow in the coming years. 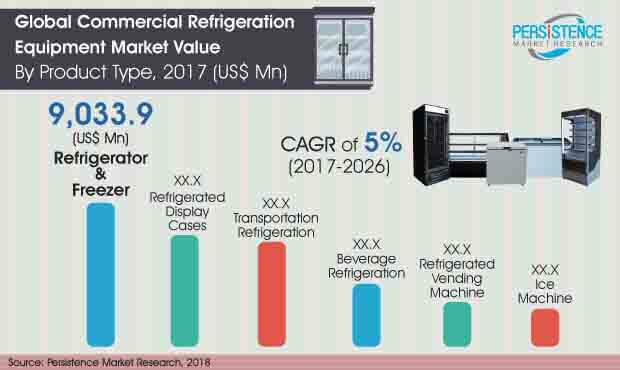 The data on the global commercial refrigeration equipment market has also been collected by analyzing demand and supply status, driving factors and other market dynamics in the global market for commercial refrigeration equipment. To report has also been developed by conducting thorough research on all the factor impacting the growth of the market. The report also offers estimated numbers in from of CAGR and year-on-year growth. This helps in understanding the global commercial refrigeration equipment market by sales point of view and helps in identifying opportunities for growth in the market. The global commercial refrigeration equipment market report also offers the corresponding forecast on revenue in form of incremental opportunity which is very important in assessing the opportunities in the market that are possible to be achieved by manufacturers. Potential resources from a delivery and sales point of view are also offered in the global market for commercial refrigeration equipment. The report also offers market attractiveness index and analysis to help the companies to expand themselves in the in the global commercial refrigeration equipment market. Increasing demand for frozen food, bakery products, and packaged food products is driving the demand for commercial refrigeration equipment. Moreover, in an effort to decrease carbon footprints, the manufacturers are focusing on developing commercial refrigeration equipment that consumes less or limited amount of energy. The U.S. Department of Energy and Environmental Protection Agency have also introduced new regulations and standards for commercial refrigeration with the focus on energy efficiency and minimizing its impact on the environment. Hence, in order to comply with the new regulations, companies are investing in the development of new refrigeration system with advanced technology. Some of the manufacturers are also redesigning the products to comply with new standards. Manufacturers are also sourcing new materials and are pursuing new safety certifications to offer a sustainable product. Supermarkets being the most energy-intensive retail businesses, with most of their load of electricity on refrigeration system are looking for commercial refrigeration equipment that can help them to save a lot on the power consumption. With advancement in technologies, companies are moving towards introducing smart refrigeration system equipped with sensors. These sensors help in controlling the temperature and also provides temperature monitoring of refrigeration units. Low-power wireless solutions are also being developed, eliminating the cost of inaccurate and manual monitoring of refrigerator units. Persistence Market Research anticipates the global commercial refrigeration equipment to experience a steady growth throughout the forecast period from 2017 to 2026. The global commercial refrigeration equipment market is also projected to be valued at the US$ 45,913.5 Million revenue towards the end of the forecast period. Refrigerator and freezer is likely to be the most preferred product in the commercial refrigeration equipment. The sales of refrigerator and freezer as compared to other products is likely to be high by the end of 2026. Refrigerator and freezer have various types including walk-in, reach-in and chest. Among these walk in and reach in refrigerator and freezer are expected to witness increased demand. Owing to the increasing number of food manufacturers, producing food products that need to be stored at a certain level of temperature, the reach-in and walk-in freezers and refrigerators are being deployed. Manufacturers of walk-in refrigerators are focusing on building customized walk-in refrigerators as per the need and convenience of the end user. Moreover, customers are also opting for customized units for a specific purpose. Some of the companies are also developing walk-in refrigerators with or without an insulated floor. Refrigerators and freezers equipped with touchscreen interface are also being developed to offer better control. In-built safety sensors are also being included in the refrigeration system to eliminate any damage in case of disruption. The global market for commercial refrigeration equipment is witnessing a growth in the mergers and acquisitions. As companies are competing to gain maximum market share. Big players in the market have started to enter into a strategic alliance with the regional and small companies, in order to establish themselves in the market. Moreover, new entrants are also coming up with innovative technologies in the commercial refrigeration equipment market. This is also one of the reasons for the growth in mergers and acquisitions.